Team USA has its first medal of the World Championships! 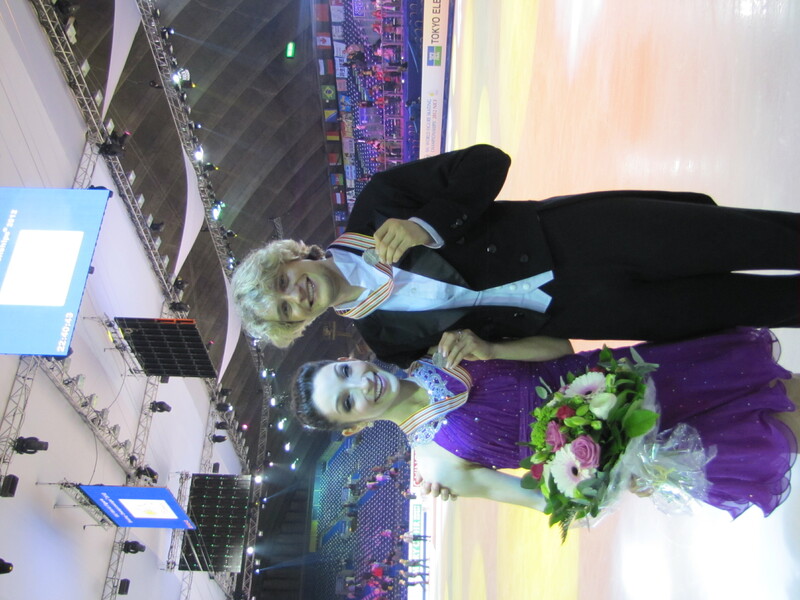 Meryl Davis & Charlie White earned the silver with a total score of 178.62 points. Davis & White have now won three straight Worlds medals, including two silver and one gold medal. Gold belongs to Canada’s Tessa Virtue & Scott Moir who edged the Americans with 182.65 points. Representing the host country, Nathalie Pechalat & Fabian Bourzat took bronze in front of an extremely excited and supportive crowd. Maia Shibutani & Alex Shibutani, despite a stumble in their twizzle element, finished eighth for the week with a total score of 144.72 points, while Madison Hubbell & Zach Donohue, in their Worlds debut, finished 10th. Totaling 143.95 points, the duo accomplished its goal of a top 10 finish in Nice. The day started out with the ladies short program. Russia’s Alena Leonova leads the way after skating to a season-high 64.61 points. The reigning Russian bronze medalist leads Japan’s Kanako Murakami and Italy’s Carolina Kostner. Team USA’s Ashley Wagner earned 56.42 points and is in eighth place while Alissa Czisny is in 16th with 48.31 points. Wagner is looking forward to her free skate to music from Black Swan, which has been her signature program this year. The men will be the last to skate the short program, with the competition beginning at 6:30 a.m. The pairs event, led by reigning World champions Aliona Savchenko and Robin Szolkowy of Germany, continues Friday with the free skate at 1:30 p.m.
Mary Beth Marley & Rockne Brubaker (10th place): 2:25 p.m.
Caydee Denney & John Coughlin (7th place): 3:29 p.m. The event’s finale features the ladies free skate at 12:30 p.m.
Good evening from Nice! The first short programs of the week began today with the pairs short and short dance. With 70.98 points, Meryl Davis & Charlie White, reigning World champions, trail Canada’s Tessa Virtue & Scott Moir by just more than one point heading into Thursday’s free dance. Davis & White are poised to earn their third consecutive Worlds medal. Maia Shibutani & Alex Shibutani totaled 62.35 points and sit in seventh place. Less than 10 points separate places one through seven. In the evening’s short dance, Madison Hubbell & Zach Donohue started things off on the right step for Team USA, earning their best score of the season with 59.56 points. They are in eighth place. Hubbell sported a new dress that got rave reviews backstage. In pairs, reigning World champions Aliona Savchenko and Robin Szolkowy of Germany lead with 68.63 points. They are followed by China’s Qing Pang and Jian Tong (67.10 points) and Japan’s Narumi Takahashi and Mervin Tran (64.37). Vera Bazarova and Yuri Larionov lead the Russian contingent and are in fourth place with 65.02 points. Team USA, whose delegation includes teams that are each skating at their first Worlds together, put out solid performances. Mary Beth Marley & Rockne Brubaker skated fourth (last in the first warm up group) and earned 59.62 points, just off their best score for the season. They are in 10th place. Two groups later, U.S. champions Caydee Denney & John Coughlin took the ice. With a fist pump to accompany their bows, the duo was clearly excited after the skate. Their efforts were recognized with 62.48 points and seventh place after the short. Coughlin noted that Team USA had a successful outing today. Competition continues Thursday with the ladies short program and free dance. The ladies short program will begin at 6:30 a.m. The free dance will begin at 1:00 p.m.
Hubbell and Donohue: 2:52 p.m.
Shibutani and Shibutani: 3:24 p.m.
Davis and White: 3:38 p.m.
Good evening from Nice, France and the 2012 World Figure Skating Championships. There has been preliminary competition both yesterday and today to set the field for the competition which begins on Wednesday with the pairs short program and the short dance. On Wednesday, 10 of the 14 members of Team USA will perform on the ice at the Palais des Expositions. The SKATING magazine blog will work as a supplement to all of the coverage being posted on icenetwork.com. Here you’ll be able to find daily updates, important links and the daily schedule for each of the Team USA performances throughout the competition. For more in-depth coverage, including live streaming of the event, visit icenetwork.com. The pairs short program will begin at 7 a.m.
Mary Beth Marley and Rockne Brubaker: 7:27 a.m.
Caydee Denney and John Coughlin: 8:36 a.m. The ice dancing short dance will begin at 12:40 p.m.
Madison Hubbell and Zach Donohue: 1:33 p.m.
Meryl Davis and Charlie White: 4:02 p.m.
Maia Shibutani and Alex Shibutani: 4:15 p.m.
Renee Felton is the media relations manager at U.S. Figure Skating. Hi everyone! I’m writing from Nice, France, site of the 2012 ISU World Figure Skating Championships. As one of Team USA’s media relations representative, I get the pleasure of watching the competition live and visiting beautiful places along the way. With a few free days (good planning, of course!) before official practice starts on Monday, I have made my way to some of the French Riviera’s most popular cities and hidden gems. The willingness to figure out public transportation has served me well! Not to mention beautiful weather and friendly people. I’m lucky to have these opportunities. After about 21 hours of travel from Colorado Springs (via Dulles and Frankfurt), I made it to Nice just after 10 a.m. on Saturday morning. No rest for the weary, I made it to the lovely Hipark Residences and my apartment-style room (where my bed is actually a pull-out couch) to quickly change. Turns out, I didn’t need to be in such a big hurry because I made it to the train station approximately one hour before the next train to Monaco-Monte Carlo. I drank a Coca Light and chatted with a woman from Toronto. After a crowded train ride down the French coastline, I arrived in Monaco to breathtaking views. I don’t think my words can give justice to the hills, cliffs, palace, sizable yachts and Mediterranean Sea. Good thing my legs were well rested from my hours of traveling because they came in handy walking up the steep hills and staircases to the Palace of Monaco – home of Prince Rainer. The grounds are also some to a Oceanographic museum (which I didn’t visit due to time constraints), gardens, cafes, souvenir shops and many scenic overlooks. Of course, the palace itself was not open to visitors but I did go inside the Cathedral. No matter how many old European churches I visit, I’m still blown away by the beauty and architecture. Not to mention a little caught off guard by the gravesites of important people that line the walls. The gardens, even in early spring, were beautiful. I can’t imagine how fragrant and full of live they become closer to summer. Now walking downhill, I made my way back past the extravagant yachts docked in the harbor and toward Monte Carlo. You want to talk about extravagance! The indoor mall, shop-lined streets, casinos and hotels made me wish my per diem would stretch just a little farther. Had I not spent so much time in Gucci, I would have walked up to the Hotel de Paris just in time to actually recognize the leggy blonde who was causing quite a stir. As the crowd dispersed, I found a restaurant and had a snack before wandering around the casino and then into the mall. I learned from a shop worker that if I pay about 6-7 Euros for a bottle of French wine, it’s going to taste good. I’m sure my friends will be happy to help me test this theory when I get home. Exhausted from the travel and walking around Monaco, I returned to Nice. Right across from the hotel is Carrefour, the big grocery store. I stopped in for some food (I still can’t figure out where people were getting their carts). Unfortunately, I didn’t buy my apples because I didn’t realize they had to be weighed in the produce section. Rookie mistake. Since then, I got some apples at a small shop . where they weighed them at the cash register. Today, I once again made my way east on the coastline, this time to a town called Eze. It’s built up into the hillside and I got a little car sick from the bus ride. But was it worth it! I visited a perfume laboratory – where I learned that the “noses” who test and develop scents go to special schools and are only allowed to work for three hours at a time, and got myself a French scent as well as some perfumed soaps from my mom. I then made my way into the old village. The rock walls were stacked up into a maze filled with restaurants, shops and even two hotels. The views from old town Eze were breathtaking. Once again exhausted, I wandered a little bit around Nice upon my return. I stumbled across “Happy Hours” at a café on Place Garibaldi right on the outskirts of old town Nice. I plan to go wander the old town tomorrow between practices. A couple beside me ordered a delicious looking bread. I’m glad I inquired as to what they were eating because I was treated to Socca <http://en.wikipedia.org/wiki/Socca> . Socca is a bread made of chickpea flour and olive oil. It’s a specialty in Nice and originated in Genoa. Very simple, very delicious. As if I didn’t eat enough bread already, I’m now snacking on a baguette and cheese I got at a local shop. I’m having a great time – I must say the only disappointment so far is that my viewing subscription to ncaa.com/marchmadness is blacked out due to my location. Well, I can’t be too choosy I guess! Tomorrow if the first day of practice. Team USA began to arrive today and I’m looking forward to getting started. Here’s hoping the U.S. has a great showing in Nice! Click the image below to view the competition notes for the 2012 ISU World Figure Skating Championships.